William (Bill) Robinson is responsible, more than anyone else, for starting the International Horn Workshops and the International Horn Society. His mission in life has been as a music educator. Bill was born in Oklahoma in 1919. He earned his degree in Instrumental Music Education at the University of Oklahoma in 1942 and became band director at Norman High School before going into the Army that same year. He played baritone and trombone in the army band in El Paso and started horn instruction with Leonard Hale, who was also a member of the band. He played in the El Paso Symphony until the band was sent to the Pacific in 1945. After being discharged from the Army in 1946, he returned to Norman, earned a master's degree from the University of Oklahoma, and resumed his position as band director at Norman High School. He studied horn with George Yeager and played in the Oklahoma City Symphony Orchestra for seven years. In 1958, after hearing the Chicago Symphony Woodwind Quintet and becoming acquainted with Philip Farkas, he went to Chicago during the summer to study with Phil. They became good friends - a friendship that lasted for the rest of Phil's life. In 1959, the Robinsons moved to El Paso TX, where Bill taught in the public schools and played first horn in the El Paso Symphony for seven years. During his years in secondary band programs, Bill developed what was called the "Breath Impulse System," which promoted breath support, tone production, and good rhythmic body feeling. With his colleague in Norman, James Middleton, and his colleagues at Baylor University, Richard Shanley, Larry Vanlandingham, and Gene Smith, he wrote a book, the Complete School Band Program for the benefit of school band directors. He later published two horn method books that were edited by Phil Farkas. Bill was the horn professor at Florida State University in Tallahassee FL from 1966-71. He was a member of the Faculty Chamber Orchestra, Faculty Woodwind Quintet, and Brass Trio. While there, he hosted the first three International Horn Workshops (1969, 1970, 1971) and was instrumental in forming the International Horn Society in 1970. He served as vice president of the IHS for five years (1971-76). In 1971, he moved to Baylor University in Waco TX, where he taught horn and later became Chairman of the Instrumental Music Division, which grew from 19 to over 125 instrumental music education students during the years from 1971 to 1986, when he retired. While at Baylor, he also played in the faculty woodwind quintet and brass quintet, the Waco Symphony, and the San Angelo Symphony. Bill was elected an IHS Honorary Member in 1978, elected to the Oklahoma Band Director's Hall of Fame in 1988, and received the Edwin Franko Goldman Award from the American School Band Directors Association in 1995. He was a charter member of the last organization in 1953. In 1999, he was honored at Baylor University as the founder of the Chamber Music Society in Waco. 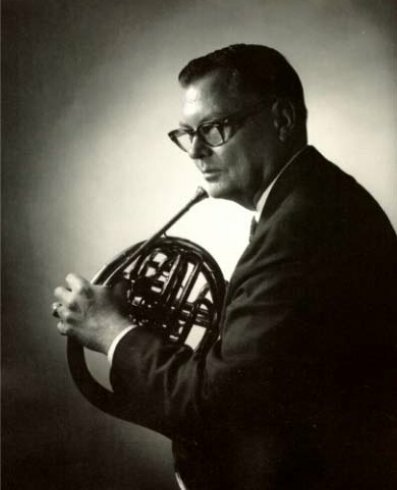 Bill studied horn with George Yaeger, Philip Farkas, Dale Clevenger, and Arnold Jacobs and also had help on the horn from Frøydis Ree Wekre and Hermann Baumann. He is presently active in teaching horn students of all ages from schools in Orlando FL and surrounding areas.